VB6: What is a Flexitarian Vegan? "Oh! Are you a vegetarian?" It is amazing how often I get asked this question at restaurants, and the answer is a simple "No". I just really enjoy vegetables! When did vegetables become exclusive to vegetarians? Plant-based diets, filled with delicious vegetable dishes, are a great option and entirely accessible to everyone looking for a more sustainable lifestyle. 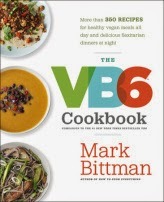 The VB6 Cookbook takes the concept of moving toward a plant-based lifestyle with moderated steps. Although I was initially very resistant to it...being extremely skeptical of anything involving the words "diet" and especially with numbers...a la P90X...but was pleasantly surprised. VB6 stands for Vegan Before 6pm, which is sort of like training wheels for people who want to go vegan or go vegetarian. Or, for people like me who love to get healthy ideas for including more fruits and veggies into their meals. The concept is that the meals before 6pm (ie breakfast, lunch, and a snack) are vegan, and dinner is a healthy meal that happens to include meat. I opened the book with rolling eyes, and after reading the brief introduction and flipping through the recipes... found myself very much enjoying it! As someone who loves finding new ways to make delicious, healthy plant-based meals, but who also loves a great burger on occasion, this is an excellent cookbook that I'll be using regularly. I prefer not to put restrictions, times, and the like on what I eat, but I enjoy this book's blend of meatless and meat-balanced recipes. I appreciated the author's laid-back, pragmatic attitude and the book's suggestions for swapping in alternatives. To test to see if the healthy vegetarian recipes are as good as they looked I made Walnut Banana Bread, which I wrote about here. Indeed, this is a new go-to in our house! Has your family started Meatless Mondays, or otherwise moving towards more plant-based , vegetarian, or vegan meals? Lavende and Lemonade was not compensated for this post. I did however receive free product to review on this blog. I learn something new everyday! I love vegetables too but also love my meat. Vegetables are very delicious. I think I can be a VB6. We do meatless mondays! My husband typically complains about it but it sure is a money saver! Wow! Great info! Thank you for sharing! Wow you learn something new everyday. Never heard of this before now. Thanks for the lesson. Well this is interesting. I have never heard of this idea. I can't see our family not eating meat, but this is interesting because you do eat one meal a day with meat. I try to add as much vegetables as possible to our diet. Luckily here, it's much. Interesting concept. I think I'd be more open to healthy vegan eating if I took moderate steps towards it, or it was only sometime. Very cool book idea. I try to incorporate fruits and vegetables into every meal, and as a healthy snack option. But I'm sure that I could do more. This is me all the way but my hubby is totally a meat and potatoes guy. I can't even get him to eat a salad! This is definitely me! Although I rarely eat fish or meat I would choose vegetables first any day! I will have to check out this book. Thank you for sharing! I love Mark Bittman! I will definitely need ot check out his book. We've been moving towards more vegetable heavy meals and less meat and it's more to do with being cost effective and to encourage more veggies. We get plenty of fruit but not enough veggies. I also like "Vegan on the Cheap". That's a great book! I'll have to check that one out, thanks for the suggestion! Interesting! I have been wanting to learn again to eat like this. I've been vegetarian since I was 2 years old, but I'm considering incorporating "vegan days" into my diet to reduce my dependence on animal products - I love veggies but I definitely eat too much cheese! The flexitarian name made me laugh. I run a vegetarian household but not strict vegan. We eat eggs and seafood. Might have to give this a try! Sounds interesting! I used to be a vegetarian for several years, but I would never be able to be a vegan. I still prefer a plant-based diet over anything else and have the utmost admiration for vegans.